Volunteer Fire Chief David Simmons speaks during the groundbreaking ceremony Wednesday for an expansion to the fire station in Donna. DONNA — City officials broke ground Tuesday for an expansion of the fire department. 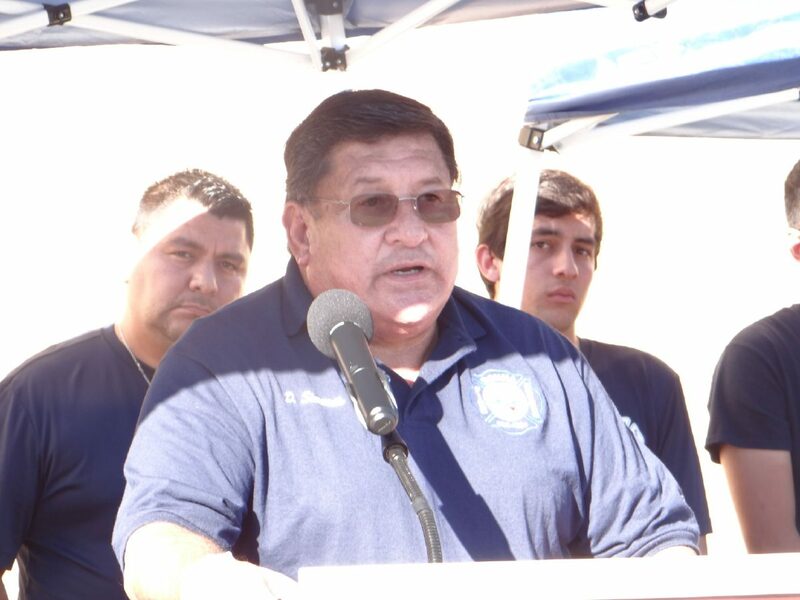 Hidalgo County Precinct 1 Commissioner David Fuentes, Councilwoman Sonia Gallegos and volunteer Fire Chief David Simmons were speakers during the ceremony held at the city’s fire station on 10th Street. A grant through the Urban County program is helping the city fund the construction of the new structure, Simmons said. The expansion will include covered space to house the newest fire trucks. Donna Fire Department has 25 volunteer firefighters and two maintenance employees who work alongside Simmons, a 30-year veteran of the department. “It’s been 34 years since this station behind (me) was initially built,” Simmons said of the original structure behind him. Fuentes congratulated Gallegos, the mayor, the city staff and all the volunteers. McAllen, Mercedes and Weslaco fire chiefs were present at the ceremony. “First responders are the people that run to these emergency situations while the rest of the people are running away,” Fuentes said. A new restroom with a shower, paved parking and a storage room will be part of the expansion. Luis Figueroa of ROFA Architects Inc. was chosen to design the building, which could be completed within six months. “We’re very proud and happy that the city is able to provide this,” Simmons said.